On November 29, 2018, the U.S. Senate Committee on Environment and Public Works (EPW) held a hearing on the nomination of Alexandra Dapolito Dunn to be the U.S. Environmental Protection Agency (EPA) Assistant Administrator (AA) for EPA’s Office of Chemical Safety and Pollution Prevention (OCSPP). The hearing was webcast and is available on the EPW Committee website. In a rare sharing of bipartisan support for a Trump Administration nominee, Senator Sheldon Whitehouse (D-RI) introduced Ms. Dunn, stating “Ms. Dunn has a deep passion for working with communities, for environmental justice, and for leveraging the expertise of nongovernmental organizations.” Senator Tom Carper (D-DE) stated he was encouraged by her plans for the office. Ms. Dunn assured lawmakers that, if confirmed, she will “commit to implementing the law, following the law, and bringing all the provisions of the law to full effect.” Dunn also emphasized her intention, if confirmed, to leverage the experience and expertise of EPA career staff, including establishing “open door” hours dedicated to connecting with career staff. Dunn’s written testimony is available on the EPW Committee website. Senators may submit additional questions for the record (QFR) through November 29, 2018, for Ms. Dunn’s response by December 3, 2018. It is being reported that Ms. Dunn could be confirmed as early as next week assuming there are no objections. Ms. Dunn has been serving as the Regional Administrator for EPA’s New England Region (Region 1) since January of this year. Prior to joining EPA, Ms. Dunn served as Executive Director and General Counsel for the Environmental Council of the States (ECOS), a national nonprofit, nonpartisan organization committed to helping state agencies improve environment outcomes for Americans. More information on Ms. Dunn’s experience and accolades is available in EPA’s press release announcing her nomination. On November 29, 2019, the U.S. Environmental Protection Agency (EPA) announced that it has scheduled the first public meetings of the Toxic Substances Control Act (TSCA) Science Advisory Committee on Chemicals (SACC). The first meeting, a preparatory virtual meeting, and will be held on January 8, 2019, from 2:00 p.m. to 4:00 p.m. (EST). The second meeting, a four-day in-person meeting, will be held on January 29, 2019, from 1:00 p.m. (EST) to 5:30 p.m. and on January 30, 31, and February 1, 2019, from 9 a.m. to 5:30 p.m. (EST). The official announcement is scheduled to be published in the Federal Register on November 30, 2018. Further information, including the location of the in-person meeting and how to register, will be posted on EPA’s TSCA Scientific Peer Review Committees website. The topic for this first series of meetings is the peer review of the draft risk evaluation for Colour Index (C.I.) Pigment Violet 29 and associated documents developed under EPA’s existing chemical substance process under TSCA. EPA states that the two-hour preparatory virtual meeting on January 8, 2019, will consider the scope and clarity of the draft charge questions for this peer review -- included with EPA’s Transmission of Background Materials and Charge to the Panel for the TSCA SACC Reviewing the Draft Risk Evaluation for C.I. Pigment Violet 29 (Attachment 23). The 4-day, in-person, public meeting will be comprised of the peer review panel deliberations and a general TSCA orientation for the TSCA SACC. A portion of the in-person meeting will be closed to the public, however, for the discussion of information claimed as confidential business information (CBI). During these upcoming meetings, EPA states that the public is invited to provide oral comments for the peer review on the draft risk evaluation for C.I. Pigment Violet 29 and related documents; comments submitted by January 14, 2019, on the draft risk evaluation will be provided to the peer review panel members before the in-person meeting. Comments on the draft charge questions will be accepted prior to and during the 2-hour preparatory virtual meeting (but preferably by January 7, 2019); the TSCA SACC peer review panel will consider these comments during their discussions. More information on the draft risk evaluation for C.I. Pigment Violet 29 is available in our memorandum EPA Publishes First Draft TSCA Chemical Risk Evaluation. On November 26, 2018, the U.S. Environmental Protection Agency’s (EPA) Office of Chemical Safety and Pollution Prevention (OCSPP) announced that Lek Kadeli joined OCSPP’s Immediate Office as Acting Deputy Assistant Administrator (AA) (Management). EPA states that Lek has extensive experience managing and supporting a wide range of environmental and human health related programs. Lek has worked at EPA previously; for eight years he was the Principal Deputy AA in EPA’s Office of Research of Development (ORD), serving several periods during that time as ORD’s Acting AA. Lek has also served as Director for ORD’s Office of Resource Management and Administration; Chief of ORD’s Resources Planning and Execution Staff; Office of International Activities Senior Budget Officer; and, as a budget analyst in the Office of Administration and Resource Management’s Office of Comptroller. Most recently, Lek worked at the World Bank Group in Washington, D.C. as the co-program manager of the Pollution Management and Environmental Health Program, Environment and National Resources Global Practice. Lek holds a B.A. in Political Science from George Mason University, and a M.A. in National Security Studies from Georgetown University. The U.S. Environmental Protection Agency (EPA) published a Federal Register notice on November 15, 2018, announcing the availability of and seeking public comment on the first draft chemical risk evaluation under the Toxic Substances Control Act (TSCA), as amended by the Frank R. Lautenberg Chemical Safety for the 21st Century Act (Lautenberg). The draft risk evaluation for Colour Index (C.I.) Pigment Violet 29 is intended to determine whether C.I. Pigment Violet 29 presents an unreasonable risk to health or the environment under the conditions of use, including an unreasonable risk to a relevant potentially exposed or susceptible subpopulation. According to the notice, EPA is also submitting these same documents to the TSCA Science Advisory Committee on Chemicals (SACC) to peer review the draft risk evaluation. EPA intends to publish a separate Federal Register notice containing the peer review meeting details. Comments on the draft risk evaluation are due January 14, 2019. EPA will provide all comments submitted on the draft risk evaluation to the TSCA SACC peer review panel, which will have the opportunity to consider the comments during its discussions. More information is available in the full memorandum. By Lynn L. Bergeson, Kathleen M. Roberts, and Richard E. Engler, Ph.D. In September 2018, the U.S. Environmental Protection Agency (EPA) issued a consent agreement with Chevron USA, Inc. (Chevron) related to an alleged violation of the Toxic Substances Control Act (TSCA). EPA’s issuance of a consent agreement for the alleged TSCA violation is not especially newsworthy. Neither is the agreed upon penalty for the violation, which could be considered minor based on the penalty provisions allowed under TSCA. What is newsworthy here is that the alleged violation, technically three as the violation occurred on three separate days, was related to the research and development (R&D) exemption. Specifically, EPA alleged that Chevron did not appropriately label chemicals that it had distributed to other companies for R&D purposes. In our experience, the R&D exemption under TSCA is seldom the subject of enforcement scrutiny. This may be changing. The R&D exemption is a critical aspect of TSCA and it offers many companies significant flexibility to research new chemical innovations. The exemption is self-implementing and thus does not require pre-approval by or submissions to EPA. Nonetheless, there are specific restrictions and recordkeeping requirements associated with reliance on that exemption. The consent agreement at issue here confirms that EPA will hold companies accountable to these requirements. The enforcement action is an important reminder to all entities relying upon the R&D exemption to ensure that they comply strictly with each element of the exemption requirements as identified under TSCA Section 5(h)(3). Companies relying on the R&D exemption for new chemical development may wish to review internal files and processes to ensure compliance, as EPA has shown its intent to pursue violations and associated penalties for non-compliance instances. On October 17, 2018, the Trump Administration published its Unified Agenda of Regulatory and Deregulatory Actions (Regulatory Agenda). There are many interesting entries, some of which are flagged here. Not surprisingly, the U.S. Environmental Protection Agency (EPA) listed implementing Toxic Substances Control Act (TSCA) amendments to enhance public health and chemical safety as one of its top priorities. According to EPA, the amendments to TSCA that were enacted in June 2016 require EPA “to evaluate existing chemicals on the basis of the health risks they pose -- including risks to vulnerable groups and to workers who may use chemicals daily as part of their jobs.” If unreasonable risks are found, EPA must then take steps to eliminate these risks but, “during the risk management phase, EPA must balance the risk management decision with potential disruption based on compliance to the national economy, national security, or critical infrastructure.” The following TSCA items were included. Microorganisms: General Exemptions From Reporting Requirements; Revisions of Recipient Organisms Eligible for Tier I and Tier II Exemptions, 2070-AJ65. The Regulatory Agenda states that EPA is still developing a revised proposal that will address concerns raised by commenters in response to its preliminary determination that certain strains of Trichoderma reesei and Bacillus amyloliquefaciens will not present an unreasonable risk of injury to health or the environment when used as a recipient microorganism, provided that certain criteria for the introduced genetic material and the physical containment conditions are met. EPA is also considering expanding the earlier proposal to prohibit the inclusion of antibiotic resistance genes in the introduced genetic material in microorganisms qualifying for the TSCA Section 5(h)(4) exemption. EPA was scheduled to issue a proposed rule by October 2018. Long-Chain Perfluoroalkyl Carboxylate (LCPFAC) and Perfluoroalkyl Sulfonate Chemical Substances; Significant New Use Rule (SNUR), 2070-AJ99. The Regulatory Agenda states that EPA is developing a supplemental proposal for part of a SNUR under TSCA Section 5(a)(2) for LCPFAC chemical substances to make inapplicable the exemption for persons who import a subset of LCPFAC chemical substances as part of certain articles. This rule was scheduled to be proposed by October 2018 and issued in final by November 2019. EPA’s initial proposed rule was issued on January 21, 2015. Procedural Rule: Review of Confidential Business Information (CBI) Claims for the Identity of Chemicals on the TSCA Inventory -- Amended TSCA Section 8(b)(4)(C), 2070-AK21. The Regulatory Agenda states that EPA is developing a proposed rule that establishes a plan to review all claims to protect the specific chemical identities of chemical substances on the confidential portion of the active TSCA Inventory. EPA is scheduled to issue the proposed rule by January 2019 and the final rule by December 2019, as TSCA directs a final rule to be issued by December 16, 2019. TSCA Chemical Data Reporting Revisions and Small Manufacturer Definition Update for Reporting and Recordkeeping Requirements Under TSCA Section 8(a), 2070-AK33. The Regulatory Agenda states that before the next Chemical Data Reporting (CDR) period of 2020, EPA intends to revise the reporting requirements to better align with new statutory requirements resulting from TSCA, as amended, to address submitters' feedback following the 2016 submission period, and may consider reporting requirements for inorganic byproducts. EPA is also proposing amendments to the size standards for small manufacturers, which impacts certain reporting and recordkeeping requirements for TSCA Section 8(a) rules, including CDR. EPA is scheduled to issue the proposed rule by December 2018 and the final rule by October 2019. Regulation of Persistent, Bioaccumulative, and Toxic Chemicals Under TSCA Section 6(h), 2070-AK34. The Regulatory Agenda states that EPA is developing a proposed rule to implement TSCA Section 6(h), as amended, which directs EPA to issue regulations for certain persistent, bioaccumulative, and toxic (PBT) chemical substances that were identified in the 2014 update of the TSCA Work Plan. TSCA directs these regulations to be proposed by June 22, 2019, and issued in final form no later than 18 months after proposal. According to the Regulatory Agenda, EPA will issue a proposed rule by June 2019. Technical Issues; Formaldehyde Emission Standards for Composite Wood Products, 2070-AK47. EPA is proposing to amend the regulations promulgated in a final rule published on December 12, 2016, concerning formaldehyde emission standards for composite wood products, specifically to address certain technical issues and further align the final rule requirements with the California Air Resources Board (CARB) Airborne Toxic Control Measures (ATCM) Phase II program. EPA issued the proposed rule on November 1, 2018, in the Federal Register; comments are due by December 3, 2018. EPA expects to issue a final rule by March 2019. SNUR for Toluene Diisocyanates (TDI) and Related Compounds, 2070-AJ91. The Regulatory Agenda states that EPA is preparing the final version of a proposed SNUR issued on January 15, 2015, under TSCA Section 5(a)(2) for 2,4-toluene diisocyanate, 2,6-toluene diisocyanate, toluene diisocyanate unspecified isomers, and related compounds; and that there are no changes in the chemicals subject to the SNUR between the proposed and final rule. EPA is scheduled to issue the final rule in November 2018. Significant New Uses of Chemical Substances; Updates to the Hazard Communication Program and Regulatory Framework; Minor Amendments to Reporting Requirements for Premanufacture Notices, 2070-AJ94. On July 28, 2016, EPA issued a rule proposing changes to the applicable significant new uses of chemical substances regulations at 40 C.F.R. Part 721 to align EPA's regulations, where possible, with the final revisions to the U.S. Occupational Safety and Health Administration (OSHA) Hazard Communications Standard. The Regulatory Agenda states that EPA is reviewing the comments received and is planning to issue a final rule in February 2019. Methylene Chloride; Rulemaking Under TSCA Section 6(a), 2070-AK07. The Regulatory Agenda states that EPA is scheduled to issue the final rule prohibiting the consumer and commercial paint stripping uses for methylene chloride by December 2018. In a press release issued on May 10, 2018, EPA stated that it will not re-evaluate the paint stripping uses of methylene chloride and will rely on its previous risk assessments. See our memorandum “EPA Will Send Final Methylene Chloride Rule to OMB ‘Shortly’” for more information on the proposed rule. N-Methylpyrrolidone (NMP); Regulation of Certain Uses Under TSCA Section 6(a), RIN 2070-AK46. The Regulatory Agenda states that EPA’s two co-proposals for NMP that were proposed on January 19, 2017 (as part of RIN 2070-AK07), will be issued in final with a future date “To Be Determined.” The first co-proposal would prohibit the manufacture, processing, and distribution in commerce of NMP for all consumer and most commercial paint and coating removal and the use of NMP for most commercial paint and coating removal. The second co-proposal would require commercial users of NMP for paint and coating removal to establish a worker protection program and not use paint and coating removal products that contain greater than 35 percent NMP by weight, with certain exceptions; and require processors of products containing NMP for paint and coating removal to reformulate products such that they do not exceed 35 percent NMP by weight, to identify gloves that provide effective protection for the formulation, and to provide warnings and instructions on any paint and coating removal products containing NMP. For more information on the proposed rule, please see our memorandum "Monthly Update for February 2017." B&C is launching a podcast November 1, 2018. 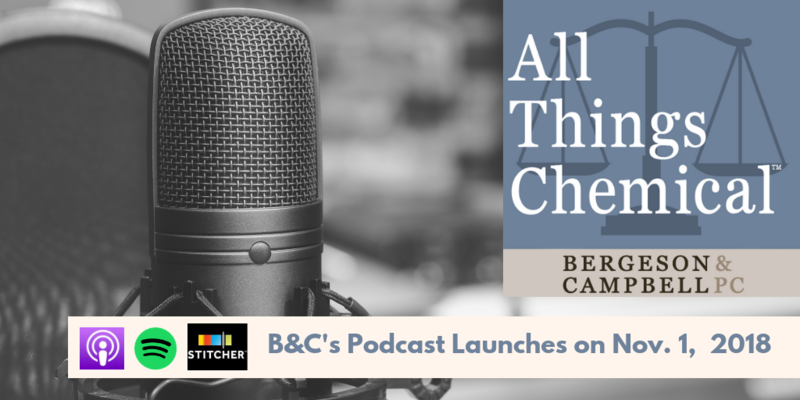 It’s called All Things Chemical™ and it will engage listeners in intelligent, insightful conversation about everything related to industrial, pesticidal, and specialty chemicals and the law and business issues surrounding chemicals. B&C’s talented team of lawyers, scientists, and consultants will keep listeners abreast of the changing world of both domestic and international chemical regulation and provide analysis of the many intriguing and complicated issues surrounding this space. A teaser introduction to the podcast is available now. Full episodes will be available November 1, 2018, on iTunes, Spotify, and Stitcher. On October 17, 2018, the U.S. Environmental Protection Agency (EPA) issued its final fees rule under the Toxic Substances Control Act (TSCA) in the Federal Register. 83 Fed. Reg. 52694. The final rule largely tracks the proposed rule. EPA is establishing fees applicable to any person required to submit information to EPA; or a notice, including an exemption or other information, to be reviewed by EPA; or who manufactures (including imports) a chemical substance that is the subject of a risk evaluation. This final rulemaking describes the final TSCA fees and fee categories for fiscal years 2019, 2020, and 2021, and explains the methodology by which the final TSCA fees were determined. It identifies some factors and considerations for determining fees for subsequent fiscal years; and includes amendments to existing fee regulations governing the review of premanufacture notices, exemption applications and notices, and significant new use notices. As required in TSCA, EPA is also establishing standards for determining which persons qualify as “small business concerns” and thus would be subject to lower fee payments. Small businesses will be eligible to receive a substantial discount of approximately 80 percent on their fees. EPA will host a series of webinars focusing on making TSCA submissions and paying fees under the final rule. The first webinar was held on October 10, 2018. The other two webinars will be held on October 24, 2018, from 1:00 p.m. to 2:30 p.m. (EDT) and on November 7, 2018, from 1:00 p.m. to 2:30 p.m. (EDT). Our memorandum provides an overview of the final rule with specific information about final fee amounts and timing and a commentary. The final rule is effective on October 18, 2018. The U.S. Environmental Protection Agency (EPA) issued on October 16, 2018, a proposed rule that would establish significant new use rules (SNUR) under the Toxic Substances Control Act (TSCA) for 13 chemical substances that are the subject of premanufacture notices (PMN). 83 Fed. Reg. 52179. The proposed rule is significant. Unlike other recent SNURs (i.e., those enacted since entry into force of amended TSCA), the 13 chemical substances are not also subject to consent orders. For this reason, the preamble contains novel language to address the new circumstances and legal issues encountered in the proposed rule. The proposed SNURs would require persons who intend to manufacture (defined by statute to include import) or process any of the 13 chemical substances for an activity that is designated as a significant new use to notify EPA at least 90 days before commencing that activity. The required notification will initiate EPA’s evaluation of the intended use within the applicable review period. Persons may not commence the manufacture or processing for the significant new use until EPA has conducted a review of the notice, made an appropriate determination on the notice, and has taken such actions as are required with that determination. Comments on the proposed SNURs are due November 15, 2018. Please see the full memorandum for more information on the proposed rule and an illuminating commentary. As part of Amazon’s commitment to responsible sourcing, Amazon has posted its chemicals policy, which includes its first Restricted Substance List (RSL). Amazon states that it defines chemicals of concern as those chemicals that: (1) meet the criteria for classification as a carcinogen, mutagen, reproductive, or other systemic toxicant; or (2) are persistent, bioaccumulative, and toxic. Amazon “strategically prioritize[s] which chemicals of concern to focus on based on product type, customer concerns, and the availability of safer alternatives.” The baseline list of chemicals of concern included on the RSL are those chemicals that Amazon seeks to avoid in Amazon-owned Private Brand Baby, Household Cleaning, Personal Care, and Beauty products in the U.S. According to Amazon, it will expand the policy to additional brands, product categories, and geographies over time. Read the full memorandum for more information and an insightful commentary. On October 5, 2018, the U.S. Environmental Protection Agency (EPA) issued the general approaches that the Office of Pollution Prevention and Toxics (OPPT) may use to identify potential candidate chemicals for prioritization under TSCA. 83 Fed. Reg. 50366. EPA notes that it will seek public comment on the approach document and on which chemicals should be identified as potential candidates for the initial 20 high-priority and 20 low-priority chemicals that must be identified pursuant to TSCA Section 6(b)(2)(B). Comments are due by November 15, 2018. EPA also released the pre-publication version of the Federal Register notice of availability of the Working Approach and “A Summary of Public Comments By Topic” (Summary). The pre-publication notice states that EPA will be opening a public docket to accept comments on the Working Approach until November 15, 2018. These comments will inform a public meeting to be held in early 2019. Upon publication of the Federal Register notice, EPA will open 74 chemical-specific public dockets, one for each of the 73 remaining chemicals on the 2014 Update to the TSCA Work Plan for Chemical Assessments that have not received manufacturer requests for EPA evaluation and an additional general docket for chemicals not on the Work Plan. These dockets will be open until December 1, 2019. A link to the list of these dockets is available here. More information on TSCA implementation is available on our website under key phrase Lautenberg Implementation.